This is a smaller meteorite which is suitable for the smaller framed person. This meteorite jewelry makes a great graduation gift, Mother's Day gift, anniversary gift, wedding gift and many other occasions! 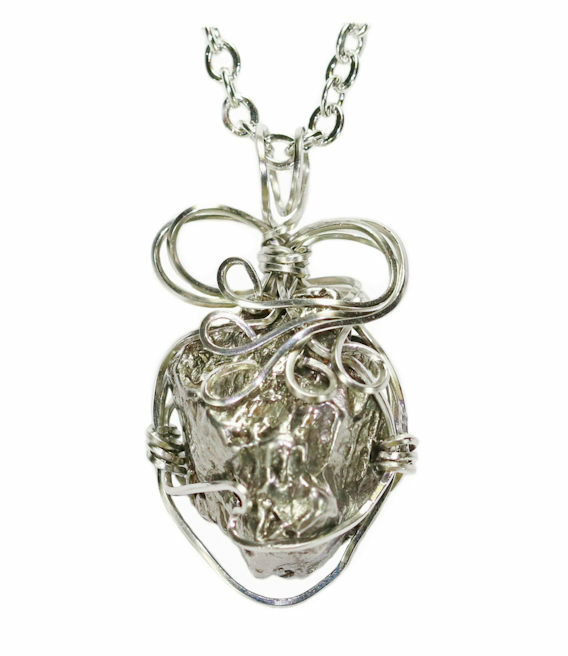 This is a more exotic wire wrapped, cosmic design free-flowing hand-made stylish jewelry. Our Campo del Cielo Meteorite Jewelry is very chic, beautiful, fashionable and affordable. The meteorites are selected for their very high quality, shape, size and overall appeal. Each is distinctively different, yet similar. Our Campo del Cielo meteorites came from a large and varied crater fields that occupy the northern part of the country of Argentina, South America. The natives knew about them first and used them as weapons and for trading. The Spanish translation for the name Campo del Cielo is "Field of the Sky." Native lore, passed down through many generations once witnessed a time when an innumerable quantity of meteorites rained down upon the Earth. This authentic meteorite jewelry is shipped in an attractive black velvet crystal jewelry box with information and a Certificate of Authenticity. All jewelry is professionally hand-wrapped in the same distinctive fashionable style. This stainless steel version that we offer is hypoallergenic and an alternative to sterling silver as it does not tarnish. Sterling silver is brighter and is considered to be fine jewelry, and is also available here on our website. This is a great gift for the love of your life, best friend, or someone special! Legally collected. Professionally wire wrapped. Stainless steel wire wrap is accompanied with a 17" stainless steel chain. 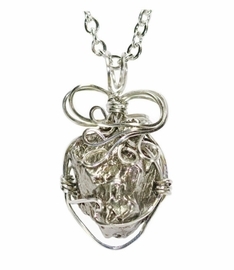 Sterling Silver wire wrap is accompanied with an adjustable 16-18" sterling silver chain. Either chain has a lobster clasp and very good quality.